Infectious diseases, HIV/AIDS and poverty have traditionally dominated the African Region but diabetes has become a new priority. Diabetes occurs when the pancreas does not produce enough insulin or when the body cannot effectively use the insulin it produces. The main symptoms of diabetes include increased thirst, needing to urinate more often than usual, and increased hunger. There are three different types of diabetes called type 1, type 2 and gestational diabetes. Surveys carried out recently in the African Region indicate that up to 15% of adults aged 25 to 64 have diabetes. Diabetes is often a silent condition and a significant number of people are unaware that they have the disease. Diabetes in the Region is a serious, chronic and costly disease that is estimated to rise to 23.9 million cases by 2030. Diabetes risk factors include physical inactivity, overweight and obesity, tobacco use and consuming foodstuffs that are high in bad fats and calories. Each year on November 14, the World Health Organization Regional Office for Africa joins the international community in commemorating World Diabetes Day. This is a day to re-commit ourselves to strengthening the prevention and control of diabetes in our region. This year the day is commemorated under the theme “Women and diabetes - our right to a healthy future”. Globally, 205 million women – live with diabetes. In the African region, in 2014, it was estimated that 22.9% of men and 38.6% of women above the age of 18 were obese. Overweight and obesity are risk factors for cardiovascular disease, diabetes and some cancers in later life. During pregnancy some women may experience a temporary rise in blood glucose above normal but still below those diagnostic of diabetes. This condition is commonly referred to as gestational diabetes. Overweight or obesity or excess weight-gain during pregnancy increases the risk of gestational diabetes or diabetes in pregnancy. Diabetes in pregnancy and gestational diabetes increase the risk of future obesity and type 2 diabetes, as well as complications during pregnancy, labour and delivery including stillbirth. Healthy diet, physical activity and avoiding tobacco use can prevent or delay type 2 diabetes. The World Diabetes Day 2017 campaign promotes affordable and equitable access for all women with diabetes or at risk of diabetes to the essential medicines and technologies, self-management education and information they require to achieve optimal diabetes outcomes and strengthen their capacity to prevent type 2 diabetes. 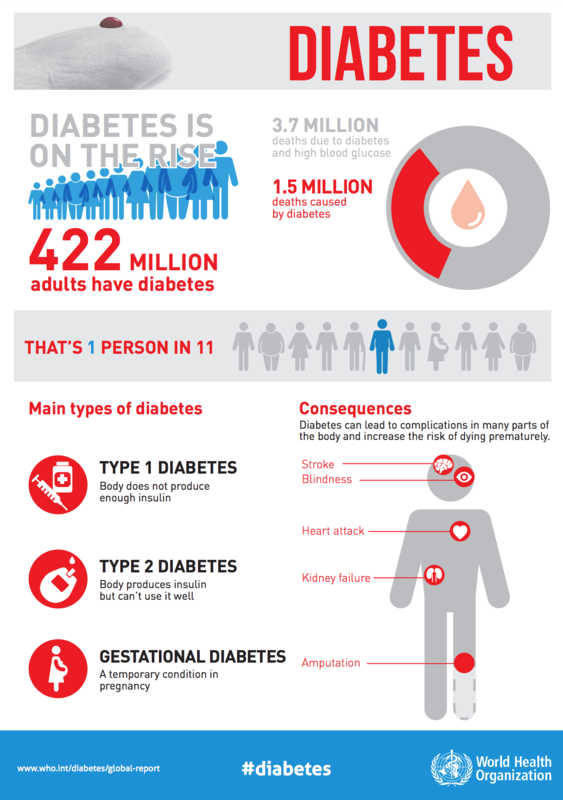 The number of people with diabetes has risen from 108 million in 1980 to 422 million in 20141. Diabetes prevalence has been rising more rapidly in middle- and low-income countries1. Diabetes is a major cause of blindness, kidney failure, heart attacks, stroke and lower limb amputation1. Healthy diet, regular physical activity, maintaining a normal body weight and avoiding tobacco use are ways to prevent or delay the onset of type 2 diabetes1. Diabetes can be treated and its consequences avoided or delayed with diet, physical activity, medication and regular screening and treatment for complications1. Diabetes is a chronic disease that occurs either when the pancreas does not produce enough insulin or when the body cannot effectively use the insulin it produces. Insulin is a hormone that regulates blood sugar 3. Hyperglycaemia, or raised blood sugar, is a common effect of uncontrolled diabetes and over time leads to serious damage to many of the body's systems, especially the nerves and blood vessels 3. In 2014, 8.5% of adults aged 18 years and older had diabetes. In 2012 diabetes was the direct cause of 1.5 million deaths and high blood glucose was the cause of another 2.2 million deaths1. The “WHO Global report on diabetes” provides an overview of the diabetes burden, the interventions available to prevent and manage diabetes, and recommendations for governments, individuals, the civil society and the private sector. The WHO “Global strategy on diet, physical activity and health” complements WHO's diabetes work by focusing on population-wide approaches to promote healthy diet and regular physical activity, thereby reducing the growing global problem of overweight people and obesity.